For Stammtisch #63 we discussed hiring internationally – a topic that has many different perspectives that need to be considered and a topic, that plays an important role for startups from the beginning. 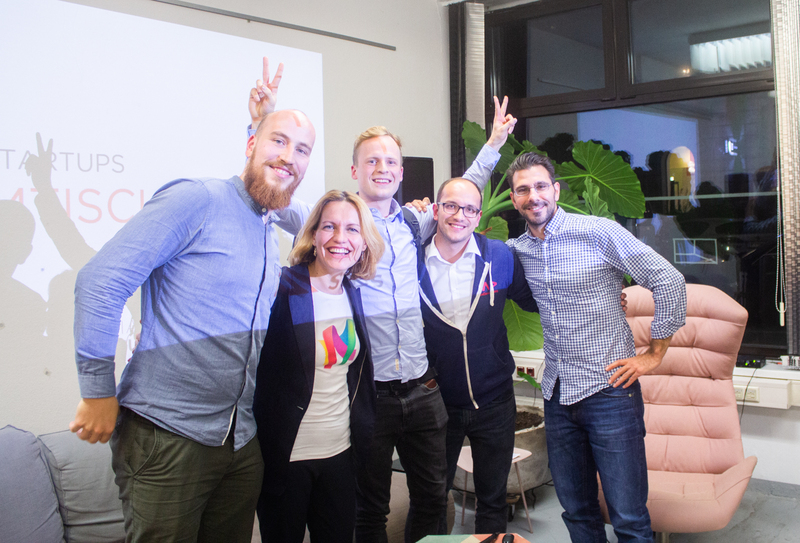 We welcomed Sead Ahmetovic from WeAreDevelopers, Felix Häusler from Grape, Anna Iarotska from Robo Wunderkind and Christoph Bitzner from TheVentury. For Stammtisch #63 we discussed hiring internationally – a topic that has many different perspectives that need to be considered and a topic, that plays an important role for startups from the beginning We welcomed Sead Ahmetovic from WeAreDevelopers, Felix Häusler from Grape, Anna Iarotska from Robo Wunderkind and Christoph Bitzner from TheVentury. Hiring internationally in general can have many different reasons. Maybe you want to increase your talent pool, or want to find people with specific technical skills, that are not easy to find in your country. Like Sead said, they see a lack of talent within Austria, especially when it comes to developers. Christoph agrees, “especially growth hackers are not easy to find here”. In his opinion, internationally talent is necessary to have a broader perspective and different opinions that lead a business to success. One of his “Aha” moments at TheVentury was when they hired a prior lawyer- now developer, who approached technical issues in a completely different way, which enabled totally new solutions and the development of new processes. Austria is a small market and in order to scale you need international experience and knowledge. By hiring only people from your country, you’ll keep a specific mindset within the company and therefore might overlook potential strategies and business opportunities in different markets. You need to look “over the Austrian Tellerrand”. International people all have a different cultural background. Culture is a powerful tool to success, that shapes not only working behavior and relationships, but also the enjoyment of work itself. It’s made out of all experiences, backgrounds and skills your employees bring to the table and will influence the environment you’re working in on a daily basis. What does it need to be hired internationally? When a company decides to hire an employee from overseas there are different things to pay attention to. You’re not only looking into technical skill sets of potential candidates. After all, our panel agreed, you can train them on the job and introduce them to company processes. It’s a broader skill set that you’re looking for- highlighted Christoph. At TheVentury potential candidates need to bring the right skill set, culture and passion to the table. Felix thinks that if somebody took the risk and chance to actually go to another country and work abroad, he or she- most of the time- has inevitably a better set of soft skills. “For us it’s not only about knowledge, but about increasing diversity and therefore success.” According to this article, divers teams can help a company to be 35% more likely, to have returns over their industry’s median. There are successful startups and companies out there that work mostly or even completely remotely – indeed there’s a whole database of such startups. Still, our panelists found remote work difficult and rather like their international employees within the country and favourably in the same room. “It’s way easier to coordinate and communicate with each other”, Felix relates, “because at some point it wasn’t possible to schedule any meetings with the whole team- having more than five different time zones to take into account”. This also made it more difficult to keep people. In some areas it’s simply necessary, e.g. product development and sales- they really need to understand the product. Anna, who’s company has offices in Austria and Asia thinks “there should always be someone on the ground”. Christoph found it difficult to build the same connection and relation even though they would stay connected over laptops, video chats etc. over the whole working day. But at WeAreDevelopers Sead realised that once you grow at a certain speed, hiring remote workers becomes more and more necessary. Bigger companies lose a lot of ground/money/projects if they do not manage to find fitting talent quickly enough. Allowing people to live wherever they want and work remotely can enlarge your talent pool dramatically. Language Barriers: According to Anna, Asia and the US are the biggest markets for international potentials, but especially with Chinese people they experienced high language barriers. She recalls that “there were many misunderstandings”. Regulations: This point stood out. All four panelists had, at some points, difficulties with getting people into Austria, or, even more often, keeping them here. All panelists recall difficulties getting so called “Rot-Weiß-Rot Karten” for employees (a working visa for 24 month). Felix said, they basically have a lawyer now to get through the proceedings more quickly, because they already lost an employee. “He had a small family, a wife and a kid. When they finally got the extension of their papers, they already needed to start the process for the next extension. So they decided to leave, because it was just too dangerous for them to have their kid taken from school one day by the police.” Sead also pointed out that a percentage of developers doesn’t even have a degree, therefore they might not even fit the criteria. And Anna added that only for a 10-weeks stay you already need a working permit. Taxes: Both, Anna and Christoph experienced high potentials turning down great job offers, because of high taxes in relation to their home country. In Anna’s case, the guy went back home, saying, he’s not interested in paying that much taxes. In Christoph’s case, the guy stayed, because the company explained and communicated all the taxes and basic insurance terms and their benefits. One positive point that is noteworthy though, is that the EU makes it possible to have access to over 500 million people that don’t need ANY visa! Startups love the EU! How to actually hire them? The experiences and opinions vary at this question. Grape is looking into hiring people from the Ukraine and Brasil, they focus on the youngest generation. The Ventury posts job ads in English. “So, if an international person is already interested, we can catch them.” RoboWunderkind is looking actively at people on LinkedIn and approaches them directly. At WeAreDevelopers it depends on the position you’re looking to fill, but they also rely on active sourcing and use social communities.